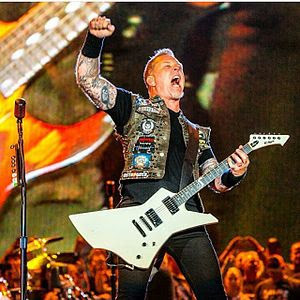 If you are in the market for an electric guitar, this james hetfield Snakebyte guitar is probably what you are looking for. 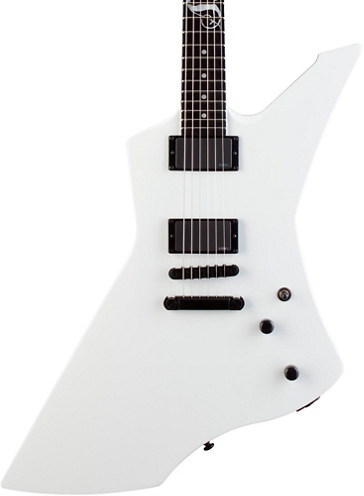 A custom body and headstock designed by James, the modified EX Series axe features an all-mahogany body and 24.75" scale set neck, ebony fingerboard with 22 extra-jumbo frets, and lethal EMG active humbucking pickups - an EMG 60 in the neck position, and an EMG 81 at the bridge. The Snakebyte comes with a vipers nest of high-end appointments, including Sperzel locking tuners, Schaller straplocks, and a TonePros locking bridge and tailpiece. People who have bought this guitar find it fun to play, gives a good feel, good pick up, has a good tone and has solid electronics to name just a few. Hetfield, the man himself performing with Metallica during Rock in Rio USA in Las Vegas, Nevada on May 9, 2015.